In order to start streaming with the Selenio Flex encoder the first thing we need to do is to power on the device. Once the device is powered and ready to use, access the web interface so we can start the configuration. To access the web interface you need to type the IP address into your web browser and press Enter. By default, the IP for Selenio Flex web interface is 10.10.10.10 so we are going to use this one. Add your streaming group and select your out profile by click the "Add" button highlighted in the image below and select your preferred streaming profile. 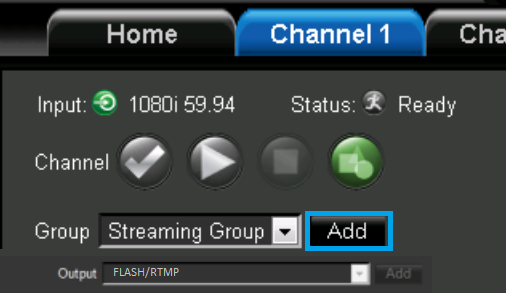 Flash/rtmp is recommended for Adobe Flash and Wowza streaming services. We are now going to input the Server Details that you can retrieve within your Primcast Control Panel or from the setup e-mail. For the "Server type" field please select "Server with Authentication". 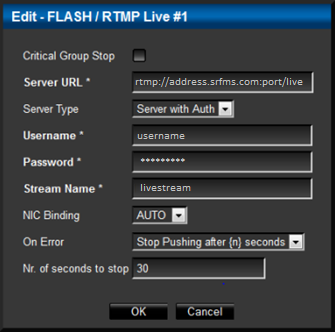 Enter your streaming address in the "Server URL" field along with the stream name "livestream", username and password. 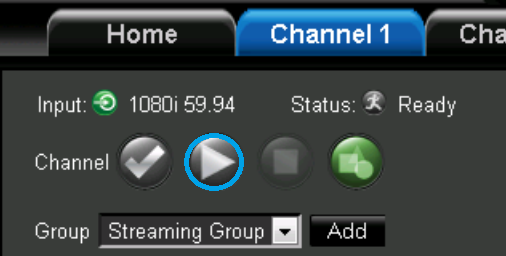 This is an example of stream URL with Primcast:" rtmp://address.srfms.com:port/live"
By clicking the "Add" button next to Audio/Video fields you will be able to configure the Audio and Video bitrate which will mostly affect the streaming quality. Click the "Add" button for video to select your desired input device, and then the same for your preferred audio input.